We bid farewell to Bobbie Golden and were on the road by 0745. We covered the 310 miles to our second night's stop in 7:45. 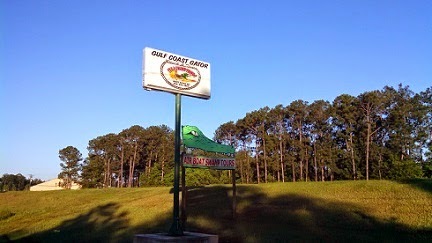 Gulf Coast Gator Ranch is also a Harvest Host member. 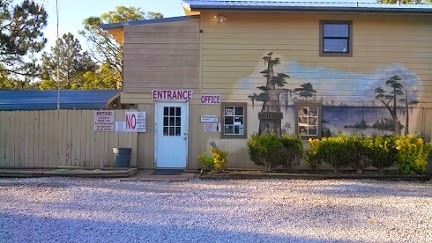 They stay alive by selling airboat rides into the swamp along with a store selling alligator theme trinkets. You all know exactly what I'm talking about. I checked in at the store where only one of the fellows working there even had a clue about Harvest Hosts. He advised that we could park anywhere in the parking lot. We set up along the outer edge of the lot. I spent some time in the store trying to be a 'good ole boy' chatting with the fellows working there. 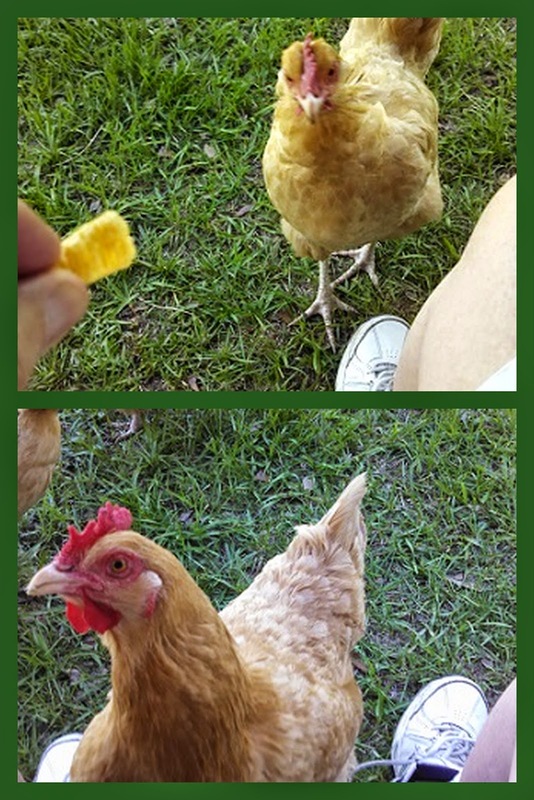 They were polite but their lack of interest was pretty obvious. 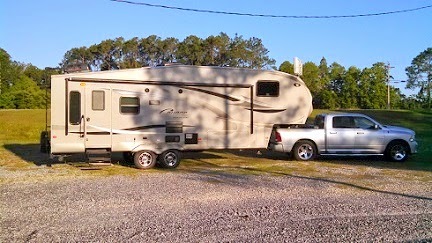 It was Saturday evening about quitting time and they had no desire to chat with some strange old man who just set up an RV in their parking lot. At 5:01PM, the door was locked and they were all laying down a dust storm getting out of the parking lot. We had the place to ourselves for the rest of the evening and night. Total peace and quiet with a full moon; broken only by the whistle and rumble of freight trains passing very close to the property. Yesterday we finished just about all of our preparation chores, so I was counting on an early start today. Not pre–dawn but not mid–morning either. We buttoned up the house (a new task for us) and were ready to pull out at 0830 but I could not get the GPS app on my phone to behave. After half an hour messing with it, I realized the phone was in airplane mode. I don't know how it got there but it was. With that straightened out we got rolling at 0900. The weather was beautiful all day long and we covered the 283 miles to our first night's stop in six and a half hours. 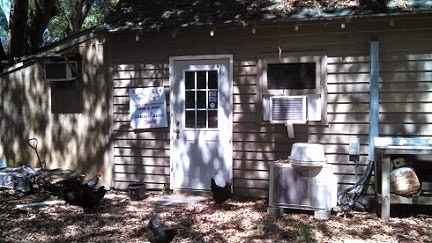 We pulled into Golden Acres Ranch just east of Tallahassee at 1530. 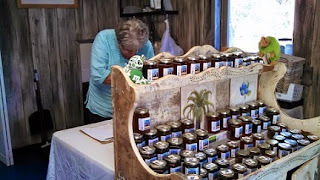 On this trip I am using our Harvest Hosts membership for the first time and today was our first stop. Harvest Hosts is a collection of private farms, wineries, and attractions that allow RVers free overnight parking. The hope is that you will buy some of their product in return for the favor. 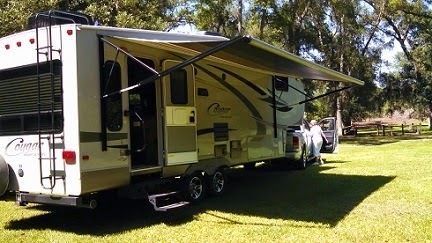 I have seen the advertisements several times over the past couple years and we joined at the Tampa RV show in January. Click on the logo at the bottom of this page to connect and learn more. Our hosts today were Bobbie and Fred Golden the owners of Golden Acres Ranch. 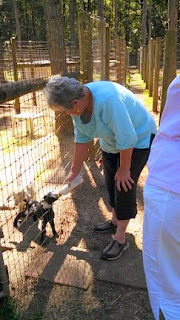 Bobbie greeted us on arrival, showed us around the ranch, and told us a bit about their history with the ranch while she bottle fed a baby goat. We met Fred Golden and chatted with him for a spell too. 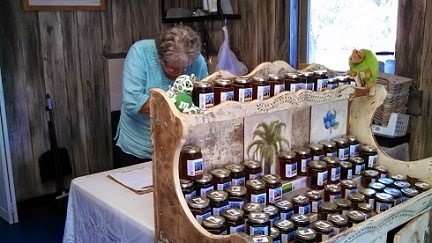 We spent some time with Bobbie in her little store, which is open whenever you ring the big bell at the house. 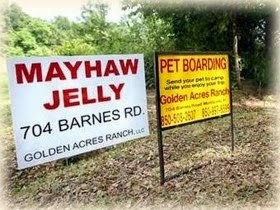 and learned about Mayhaw Jelly. We had a taste and of course had to buy some. Bobbie was very interested in our WorKamping experiences and the whole idea behind it, so I gave her the web addresses for Workamper News and Workers–On–Wheels. I think she will join those two sites and we will soon see her ads in those publications. This evening we relaxed at our rig and socialized with the chickens. 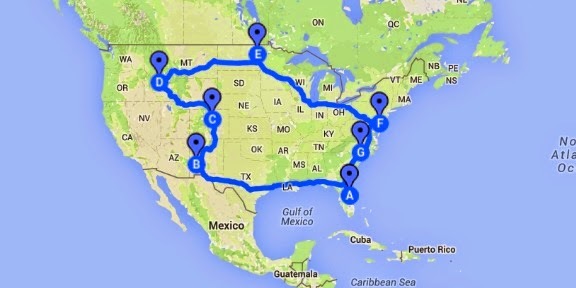 The other day I published the route for our summer 2015 road trip. I was pretty satisfied with myself until my daughter Tricia put me on to THIS road trip. If you love math like I do, you'll love this. Randy Olson is a fourth-year Computer Science & Engineering Ph.D. candidate at Michigan State University and Tracy Staedter is a producer for Discovery News/Tech. Randy teamed up with Tracy to produce this road trip. With those objectives in mind, Tracy compiled a list of 50 major U.S. landmarks — one in each state excluding Alaska/Hawaii and including D.C., and two in California. 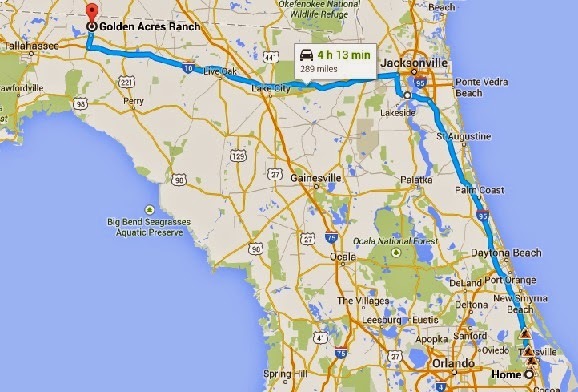 Here are three stories about this mathematics project/road trip by Randy, Tracy, and Snopes. And boy did these stories get comments. Many of the comments were about the choice of sites. All those folks missed the point of the story – THE MATHEMATICS THAT PRODUCED THE MAP. You could pick any location. Enjoy the stories AND the comments. 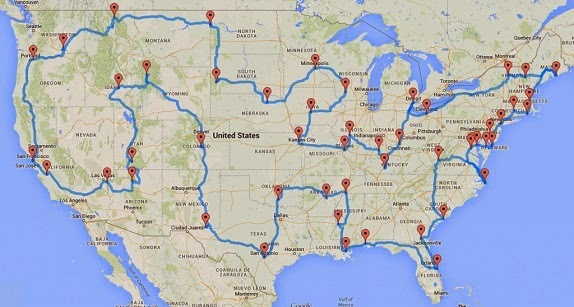 And here is my paltry 2015 road trip.